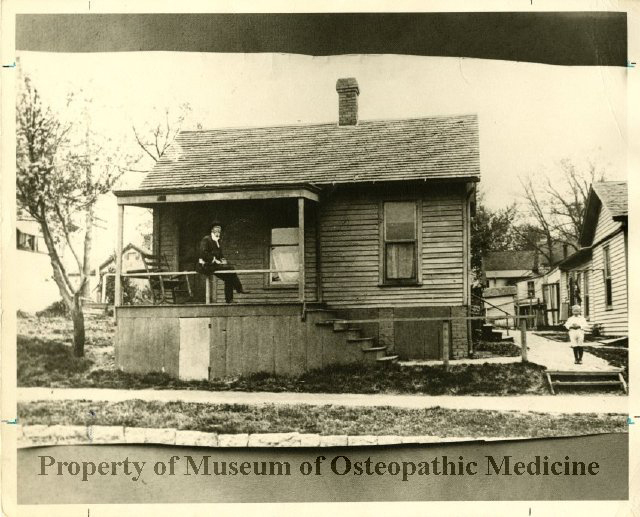 The Museum of Osteopathic Medicine maintains a vast online collection of more than 80,000 objects, photographs, documents and books dating from the early 1800s to the present. Here we present the most requested images from our collection. All images, including those below, can be ordered by following these instructions. Andrew Taylor Still Postcard Climbing on Tree Branch; No Date. 13.7 cm (l) x 8.5 cm (w). 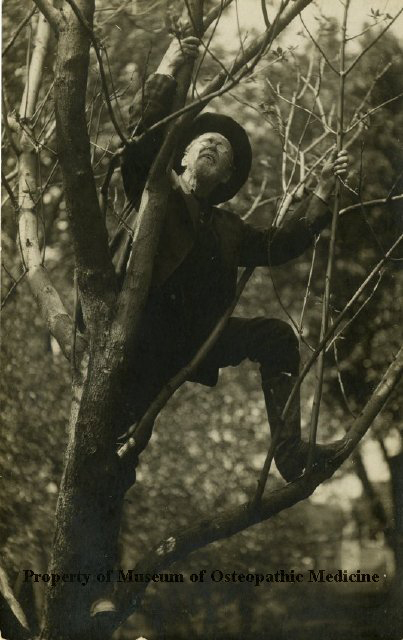 Andrew Taylor Still shown climbing a tree in a black suit, hat, and vest, and wearing glasses. Edges of postcard slightly worn. Back of postcard blank. Andrew Taylor Still Portrait Wicker Chair; No Date. 25 cm (l) x 20 cm (w). Photo reprint in good condition. 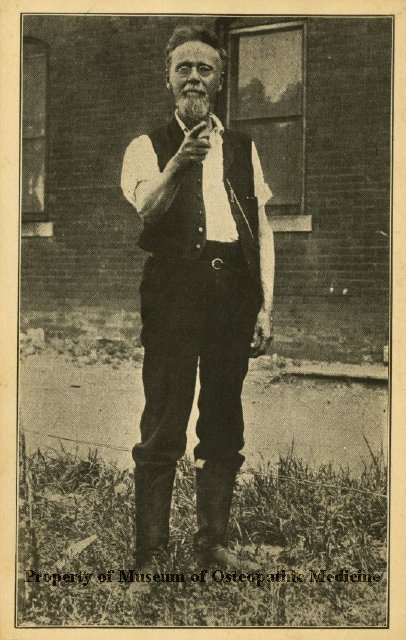 Andrew Taylor Still Postcard Pointing Finger; 1908 Jul 1. 13.8 cm (l) x 8.6 cm (w). Andrew Taylor Still's sleeves rolled up and wearing an unbuttoned vest and boots. Postcard slightly discolored. Back of postcard blank. 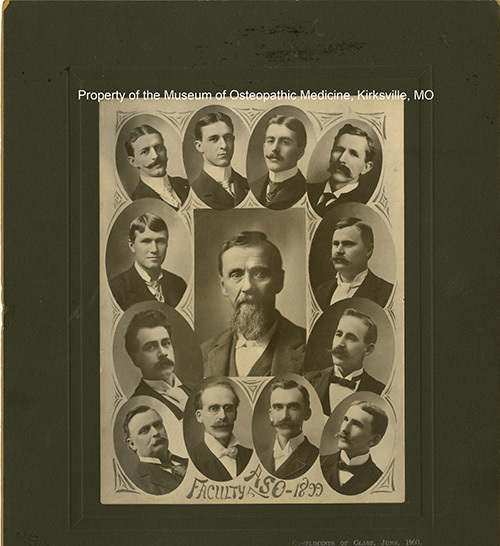 Photo of first graduating class from the American School of Osteopathy; Parcell, Kirksville, MO; ca.1893; 16.5 cm x 10.8 cm. Sepia; Good condition. Andrew Taylor Still's Business Card; No Date. 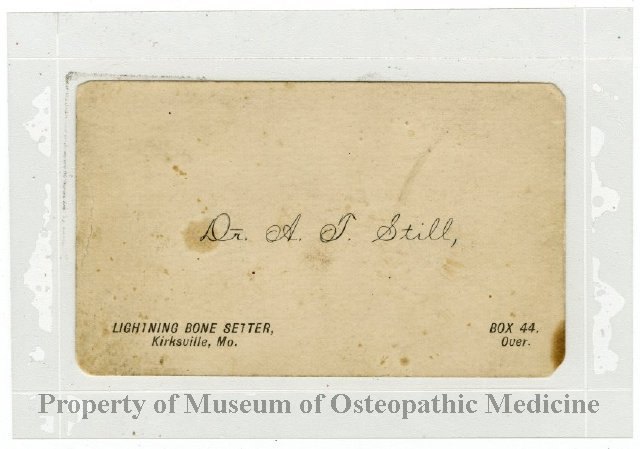 White card stock with black type, "Dr. A. T. Still" and "Lightning Bone Setter, Kirksville, Mo. Box 44 over" on the front, information about different conditions treated by Andrew Taylor Still; 10.2 cm (w) x 6.2 cm (h). Sealed in a mylar, front and back is dirty with numerous acid stains on card, large dot stain on the letter 'D' on and a dark stain in bottom-right corner, bottom-left corner dirty, two large stains on the back, dark stain in bottom left corner, lower right corner torn. 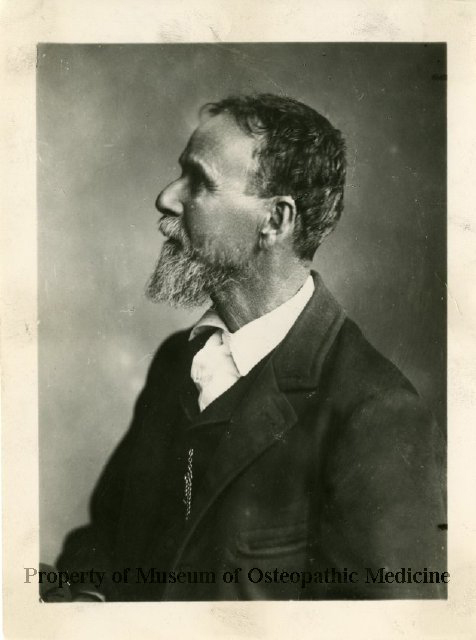 Andrew Taylor Still Torrey Painting Photo; No Date. 15.8 cm (l) x 10.8 cm (w). 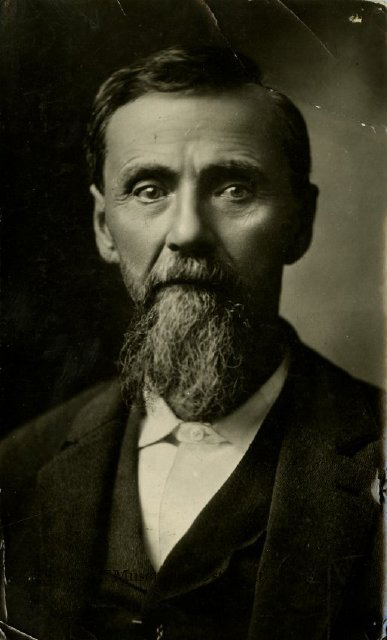 Sepia toned photo of painting of Andrew Taylor Still painted by George Burroughs Torrey in 1908. Edges of front side of photo have slight wear. Back of photo is acid burned, water damaged, and has some remnants of black construction paper in upper portion and has a diagonal blue ink stain. 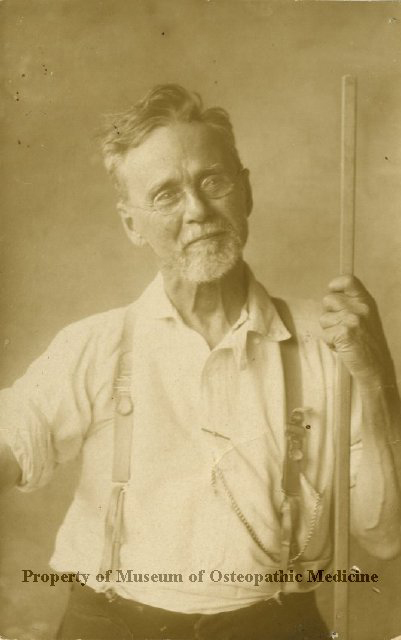 A. T. Still studio portrait, informal, wearing white shirt and suspenders, with walking stick; watch chain visible; ca. 1907. Sepia; 8.7 cm x 15.7 cm. Back of postcard blank and mottled with small stains. Tack marks in upper and bottom right corners. Andrew Taylor Still Portrait; ca. 1894. 16.3 cm (l) x 10.6 cm (w). 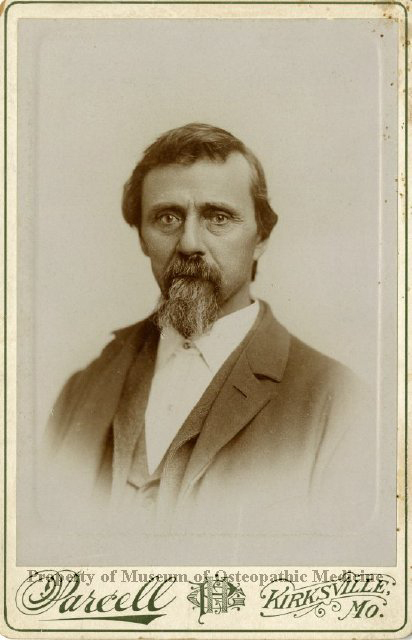 Parcell Studio photo portrait of Andrew Taylor Still in a dark suit with a beard. Right edge of photo stained. Back of photo also stained on the left margin and slightly in the center. Andrew Taylor Still Portrait Holding a Newspaper; ca. 1895. 16.3 cm (l) x 10.6 cm (w). Andrew Taylor Still is shown wearing striped pants, a dark suit and vest, and holding a newspaper in his left hand. 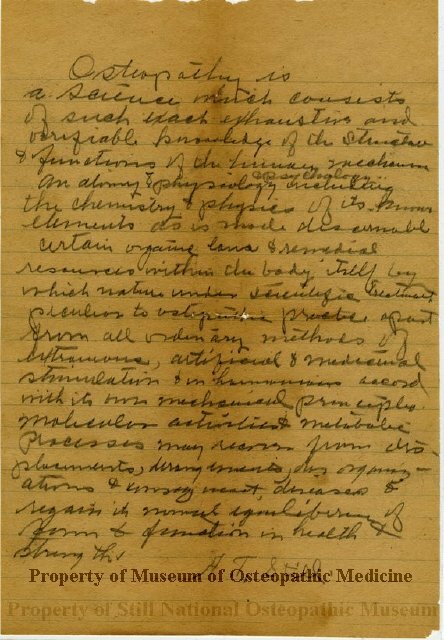 Dr. Andrew Taylor Still written in pen along top of photograph. Parcell Studio, Kirksville, MO information printed along bottom edge of photograph. Photo mounted on a heavier cardboard backing. Image slightly dirty. Back of photograph has glue remnants and staining. 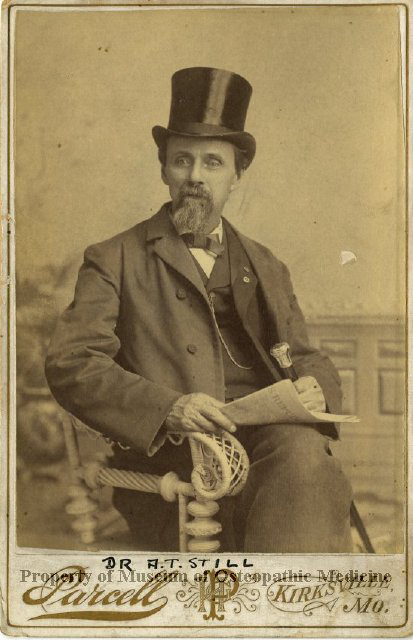 Photograph of Andrew Taylor Still in Tophat with Cane; No Date. 16.4 cm (l) x 10.6 cm (w). Dr. A.T. Still written underneath photo. Edges of photo extremely dirty. Small tear in the center of the right side of the photo. Back of photo is extremely damaged with glue remnants and multiple tears. 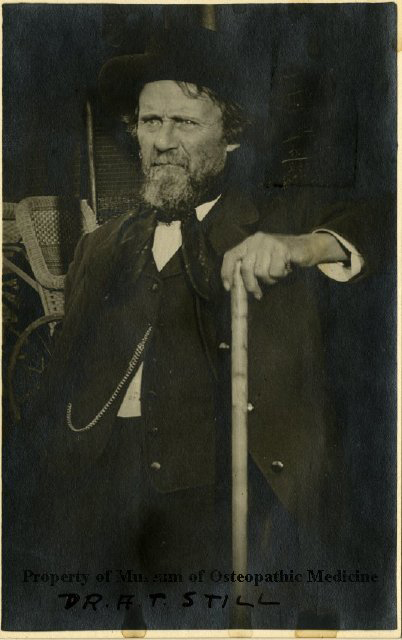 Andrew Taylor Still Photo with Walking Stick Left Hand with Wicker Wheelchair in Background; No Date. 8.7 cm (w) x 13.7 cm (l). No date given. Dr. A.T. Still written in black pen along bottom edge of front side of photograph. Dark staining along bottom and top edges of front side of photograph as well. 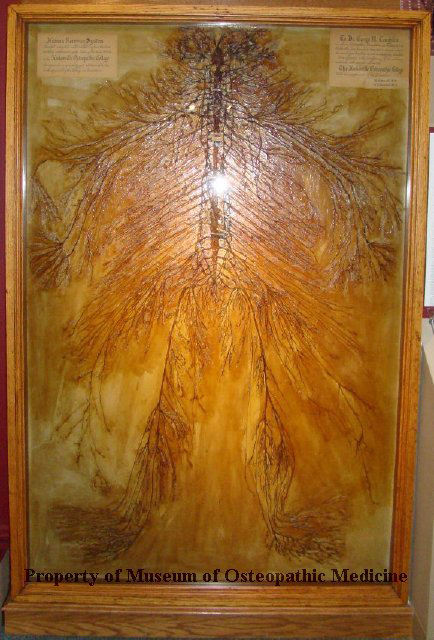 Fully Dissected Nervous System; 1925-1926. Dissection of the nervous system completed by M.A. Schalck and C. P. Ramsdell, human remains on wood with shellac finish, small paper labels throughout the dissection; 121 cm (w) x 183 cm (h). Shellac cracked and heavily discolored, paper labels are beginning to deteriorate. 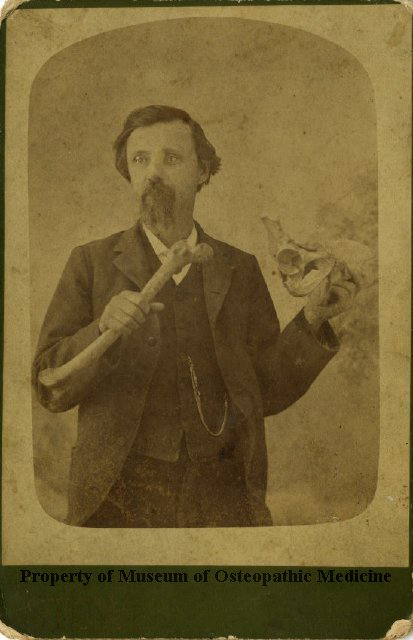 Sepia Toned Andrew Taylor Still Photo with a Femur and Pelvis; No Date.16.2 cm (l) x 10.5 cm (w). Photo very dirty. 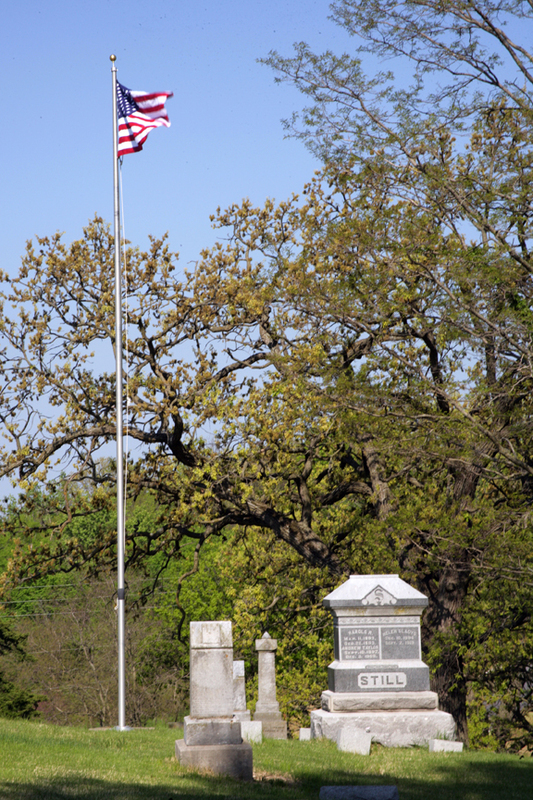 Image has a rounded edge around it surrounded by a square off-white border. Stowe photo studio labelled in bottom left corner of front of photo and 518 Broadway, Hannibal, MO address for photo studio in bottom right corner. All corners, front and back, have damage. 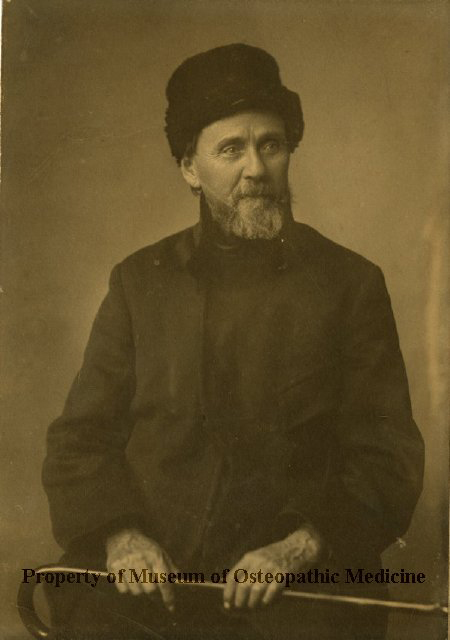 Sepia Tone Photo of Andrew Taylor Still Wearing a Fur Hat; No Date. 13.8 cm (l) x 9.6 cm (w). Corners slightly damaged and "Ruby L. Beare, 1143 E. 24th" written along top of back of photograph. Good condition. Andrew Taylor Still seated on porch of First School with child in driveway. No date. 50.3 cm (l) x 30.1 cm (w). Photo printed on heavy paper. Handwritten note in ink in upper left corner on back of photo identifying where picture taken. Edges irregularly cut and very damaged. Top edge has multiple large rips. Bottom edge creased. Acid burning along top edge. Back of photo stained. 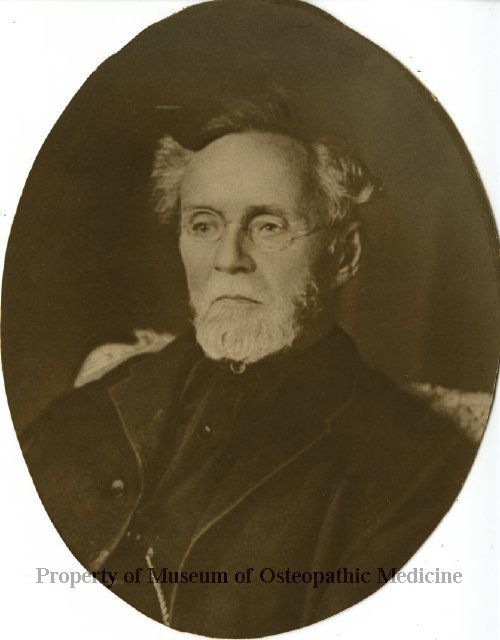 Black and White Portrait Photo of Andrew Taylor Still; No Date. 19.5 cm (l) x 11.9 cm (w). Andrew Taylor Still shown wearing a dark grey vest and suit coat, and white dress shirt. He has dark brown hair and a long beard which is mottled with majority of white hair. Upper right corner of front side of photo is heavily folded and there is a pin hole. 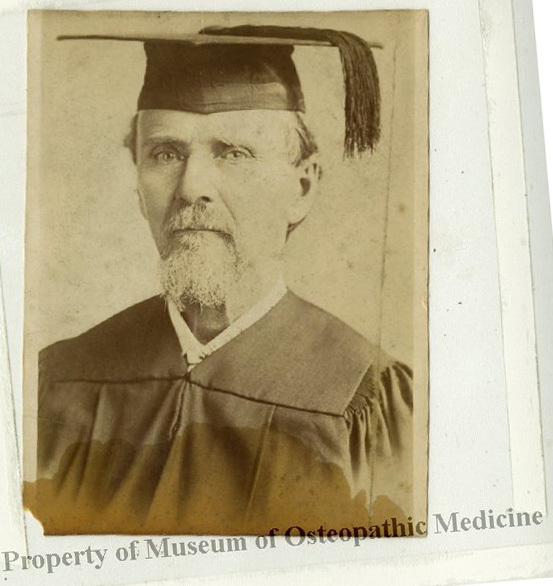 Back of photograph is labelled Dr. Andrew Taylor Still, Founder of Osteopathy, along the top. Five areas taped with yellowed tape for previous repairing. 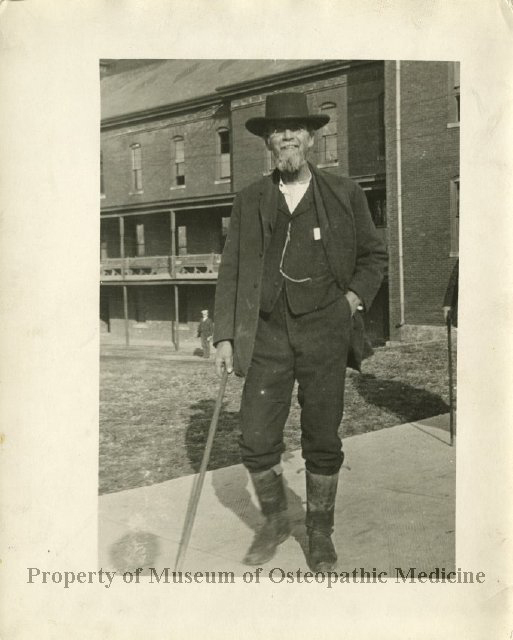 American Osteopathic Association stamp in center of back of photograph and Ray G. Hulbert's stamp is crossed out in pencil in lower left corner. 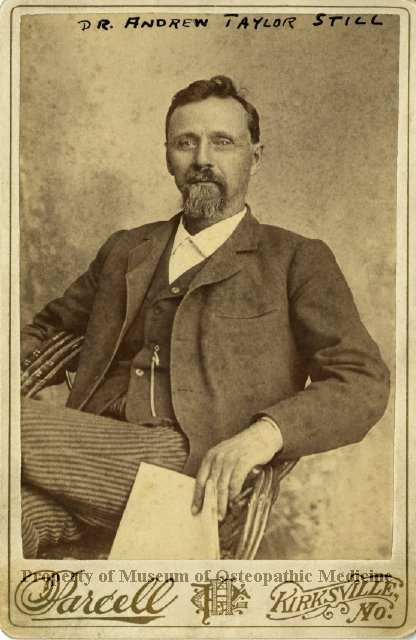 Andrew Taylor Still Family Portrait; Before 1908. 25.1 cm (l) x 20.2 cm (w). 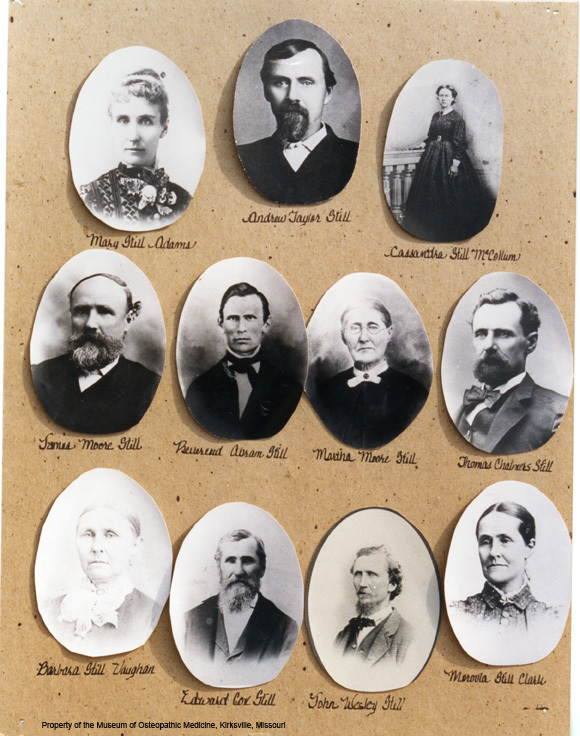 Andrew Taylor Still shown in top right row along with (bottom right left to right) Harry Mix Still, Herman Taylor Still, and Charles Edward Still and (top row left to right) Blanche Still Laughlin and Mary Elvira (Mrs. Andrew Taylor Still). Bottom margin of photo slightly warped and back of photograph dirty and has large stain extending from center to the right margin. Andrew Taylor Still Demonstrating Manipulation Techniques With Nurses; ca. 1907. 17.6 cm (l) x 12.8 cm (w). 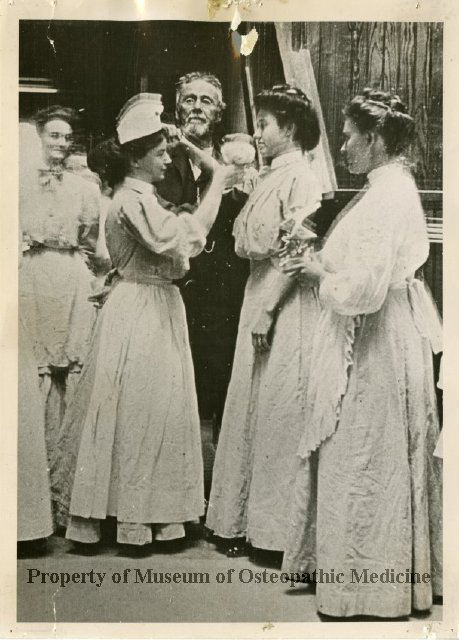 Still (third from left in photo) is surrounded by four unidentified nursing students in a wood paneled room. Still's right arm is raised and holding one of the nurses's arms and assisting in the demonstration of a manipulation technique. Information printed on the back of the photo states photo reprinted by Dr. H.V. Halladay from film made from photo originals owned by Bill Smith. Print made in Chicago, Illinois on 1940 Jul 6. All corners of photo have holes from staples which were removed. Tear and stains in the center of the top margin of the photo. Stains from glue residue on the top and bottom margins and in the center of the right margin on the back of the photo. 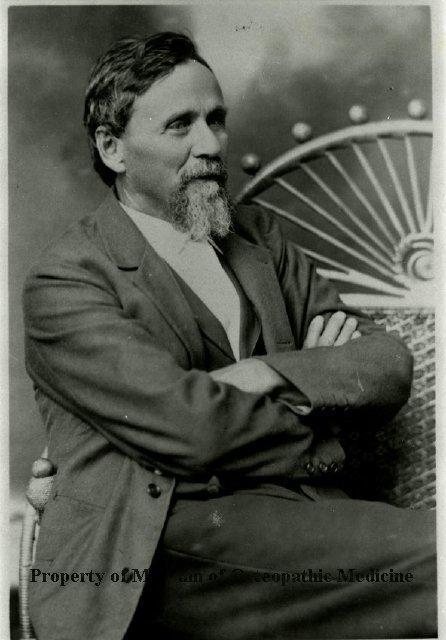 Andrew Taylor Still Black & White Seated 3/4 Length Profile Picture; No Date. 15.2 cm (w) x 11.2 cm (w). Small ink stains throughout front of photograph. Back of photo is covered with eight small tape pieces. Labelled as A.T. 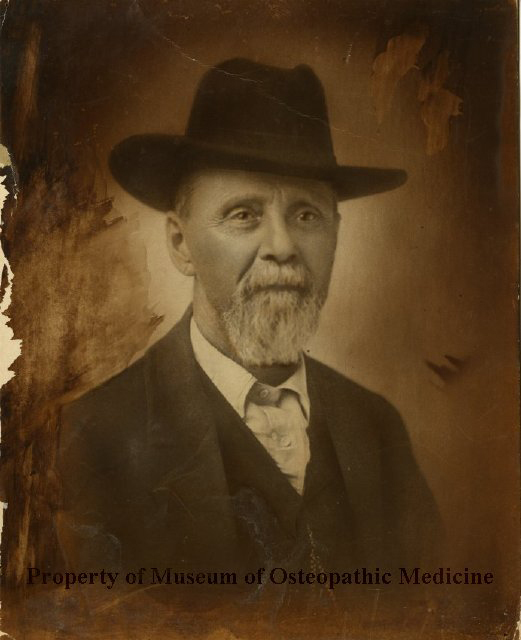 Still, founder of Osteopathy. Andrew Taylor Still Pointing at new building with Charles Still; No Date. 9.7 cm (l) x 8.3 cm (w). Andrew Taylor Still in suit, vest, and riding boots wearing a black hat and pointing with his extended right arm. Charles Still on the left side of the photo looking towards building. Large group of men in background. Top left corner of photo ripped and acid burnt. Staple holes in all four corners. Heavy acid burning from tape adhered to back side of photo in all four corners. 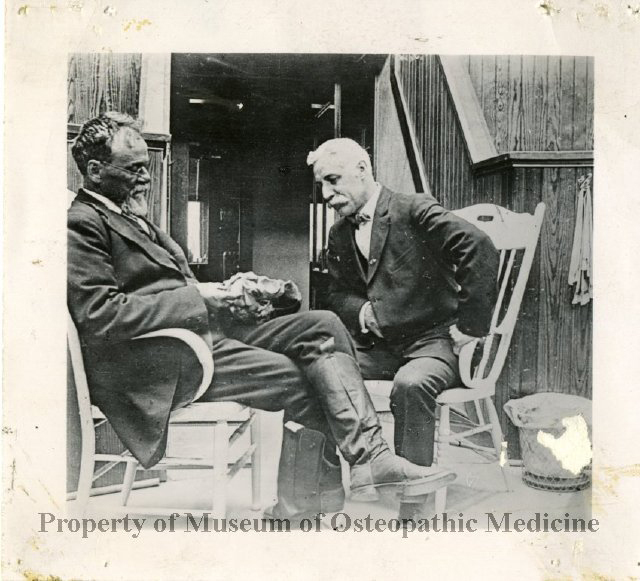 Andrew Taylor Still Examining Pelvis with Dr. F.G. Cluett; 1908 May. 9.2 cm (l) x 8.3 cm (w). 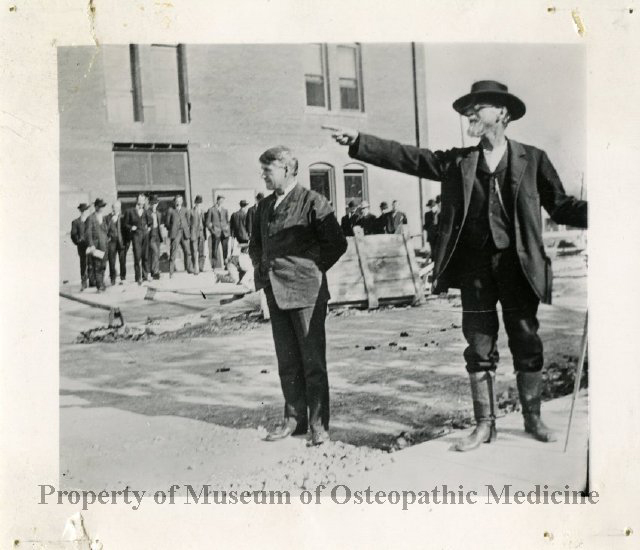 Andrew Taylor Still is shown holding a pelvis while Dr. F.G. Cluett looks on. 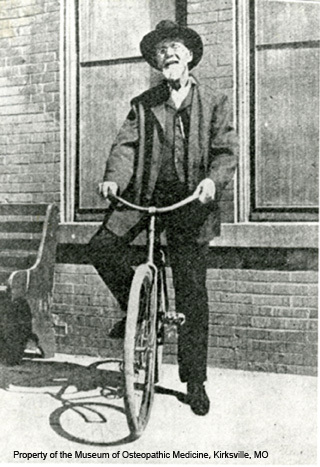 Still is shown wearing a dark suit and glasses and wearing boots. All corners have staple holes and lower right and left corners are dirty. Back of photo has extensive damage from tape in all corners. 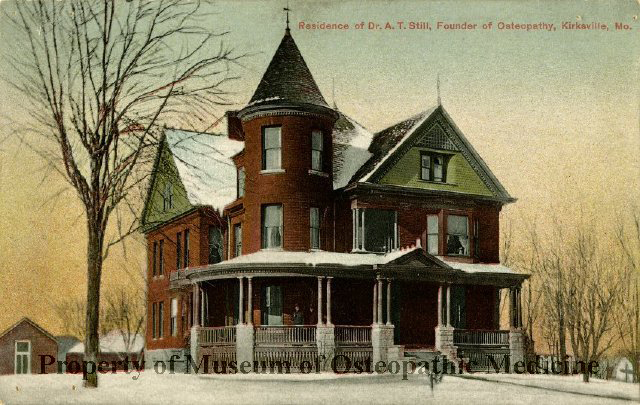 Postcard of the last home of Dr. Andrew Taylor Still, ca. 1900. Cardstock; color; 13.7cm x 8.7cm. 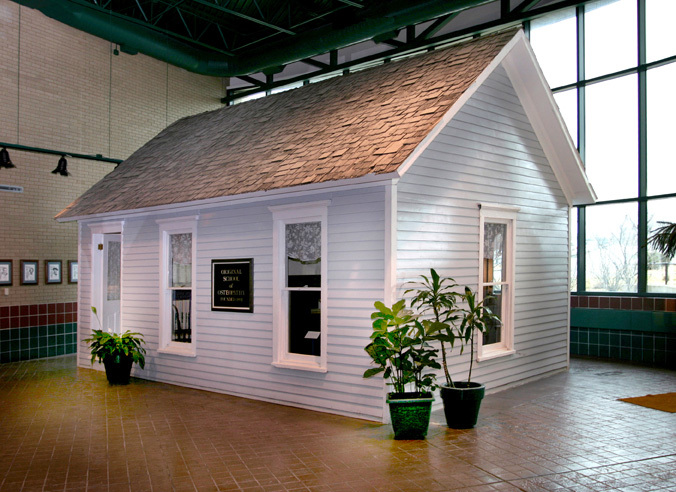 Color artistic rendering of the home of Dr. Andrew Taylor Still during winter with two men standing on the front porch. Staple holes in the corners and written in pencil on back: last home of Dr. Still. 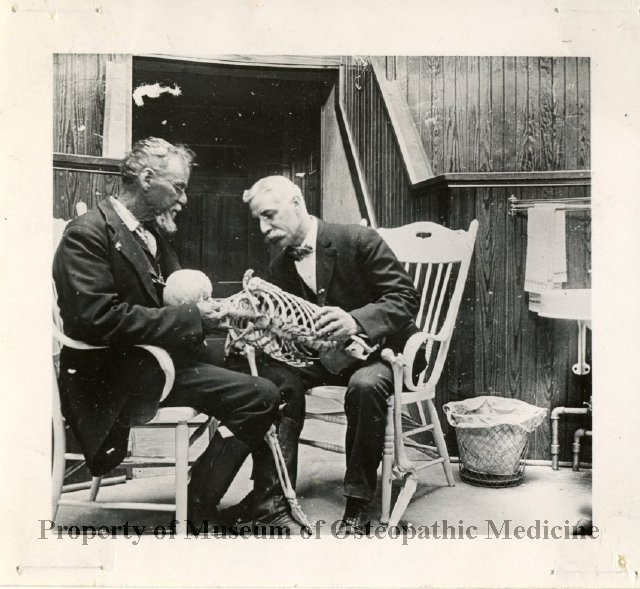 Andrew Taylor Still Examining Skeleton with Dr. F. G. Cluett; 1908 May. 9.4 cm (l) x 8.5 cm (w). Andrew Taylor Still shown seated in wooden chairs with Dr. F. Cluett and holding a skeleton. All corners of photograph have staple holes. Back of photo has tape remnants and stains in all corners. Photo stamped with "631" on reverse side. 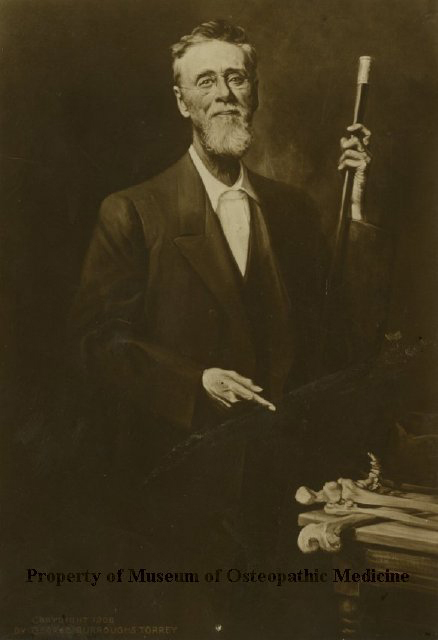 Large Andrew Taylor Still photograph of Still in front of the infirmary wearing boots, watch chain, suit, and top hat and carrying a walking stick in his right hand; No Date. 25 cm (l) x 20 cm (w). All corners slightly bent and small staining on right and left borders of front side of the photograph. Back of photo stained and labelled as Dr. A.T. Still in center of top of the back of photograph. 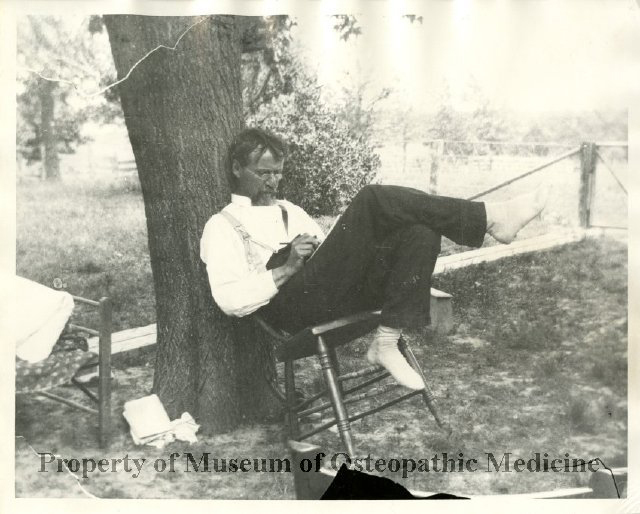 Black & White Photograph of AT Still Reclining in Chair at Millard Farm; No Date. 25 cm (l) x 20.2 cm (w). Black discoloration from plate original in center of bottom of the photo and scratches in the original photo are transferred onto this reprint in the top left corner and bottom left and right corners. Photo itself in good condition. 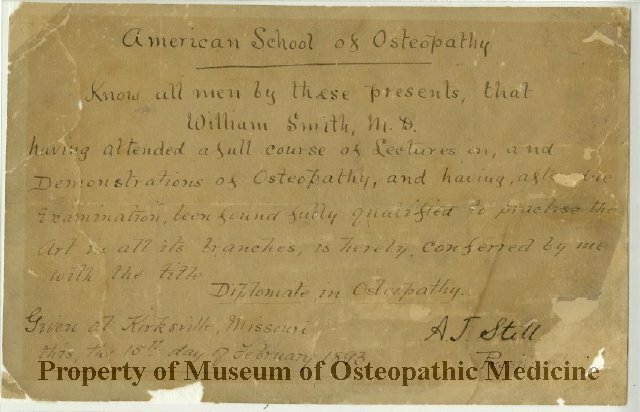 William Smith diploma from American School of Osteopathy, [1893 Feb 15]. Paper diploma. 31.2 cm (l) x 20.1 cm (w). Diploma from the American School of Osteopathy which states: American School of Osteopathy Know all men by these presents, that William Smith, M.D., having attended a full course of lectures on, and demonstrations of osteopathy, and having, after due examination, been found fully qualified to practice the Art in all its branches, is hereby conferred by me with the title Diplomate in Osteopathy Given at Kirksville, Missouri, this the 15th day of February 1893 A.T. Still, President Diploma extremely discolored and torn in numerous places. Staining on back of diploma and handwritten pencil notes. Andrew Taylor Still Small Portrait Reprint; No Date. 17.7 cm (l) x 12.5 cm (w). 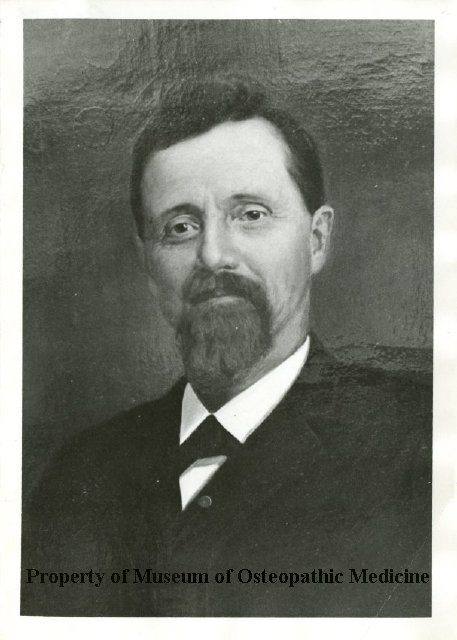 Photographic reprint of a painting of Andrew Taylor Still shown shoulder length and wearing a suit and tie. Long dark beard and dark hair. Photographic reprint creased in bottom right corner and photo slightly warped. 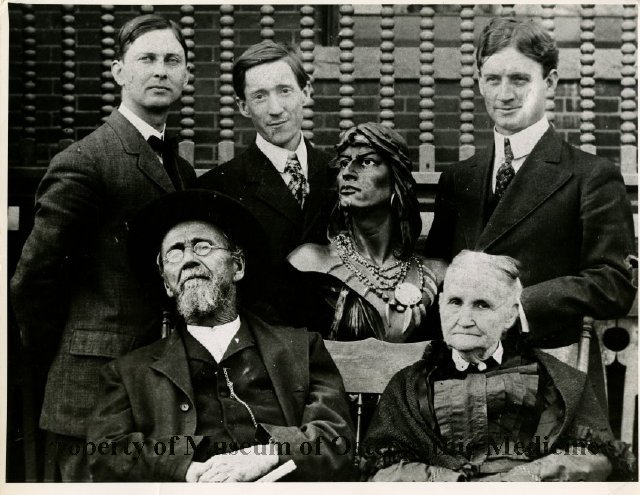 Andrew Taylor and Mary Elvira Still with Faculty & Indian Bust; No Date. 25.2 cm (l) x 20.4 cm (w). Enlarged photographic print. 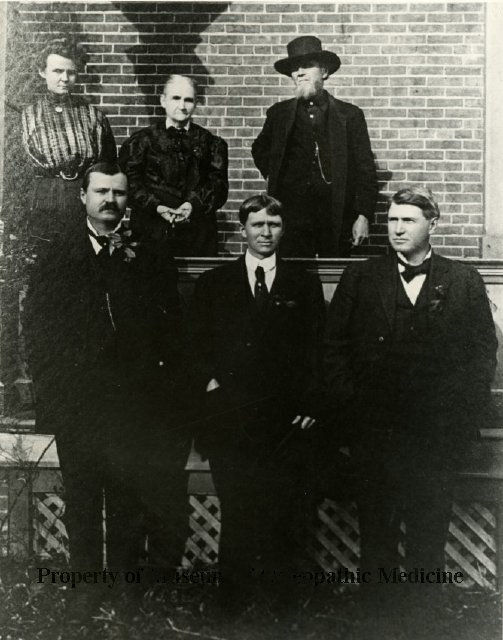 Pictured (back row left to right) are Franklin Fisk, D.O., R.E. Hamilton ("Peewee"), D.O., and Frank A. Pratt and front row (left to right) Andrew Taylor Still and Mary Elvira Still. Photo taken in front of a porch with a ribbed railing. The Stills are seated on a wooden bench. Back of photo slightly dirty. 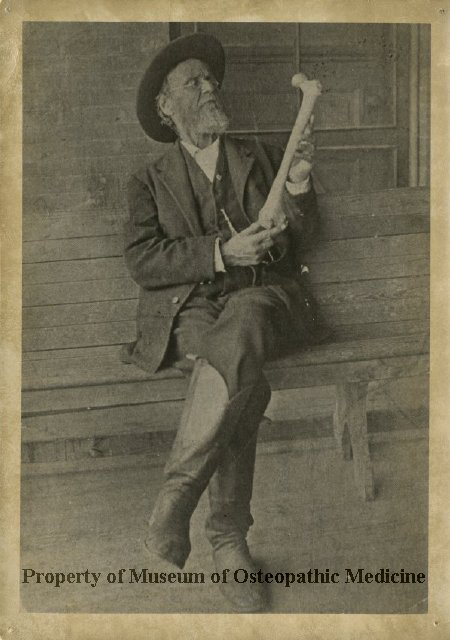 Black & White Photograph of Andrew Taylor Still Holding a Femur; No Date. 17.7 cm (l) x 12.5 cm (w). Front of photo very dirty. Pin holes in all four corners. Black and White Photo of A. T. Still Wearing a Cap and Gown; ca. late 1890s. 10.5 cm (l) x 8.1 cm (w). Fully encapsulated. Bottom left corner ripped and lower portion of front photo stained with water damage. Photo printed on a cut down postcard. Andrew Taylor Still Formal Portrait Wearing Fedora; ca. 1905. 25 cm (l) x 20 cm (w). Left edge of front of photograph damaged with surface of photo worn away. All corners notched and some of photograph surface missing. Center of top of photo extending to right corner is notched and bent. Water damage on back of photo. Slightly fragile. Andrew Taylor Still Large Oval Portrait; ca. 1914. 22.5 cm (l) x 17.7 cm (w). Andrew Taylor Still pictured in a suit, vest, and glasses sitting in a chair draped with a fur. Oval portrait that was once framed. Edges slightly worn. Back of photo heavily acid burnt. 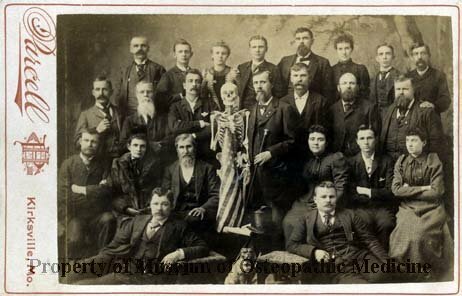 American School of Osteopathy faculty composite photo, . Black and white photograph mounted to a gray backing. American School of Osteopathy composite faculty image including Andrew Taylor Still (in center) and other faculty members including William R. Laughlin (top left corner), Marion E. Clark, Carl McConnell, William C. Proctor, Charles E. Still Sr., Harry M. Still, William Smith, Arthur G. Hildreth, George Ellison, J. Martin Littlejohn, James B. Littlejohn, and David Littlejohn. Edges of photo worn. Staining along top edge of photo backing. Staining on back of photo and hang tag made from scrap paper hung in center along top edge. 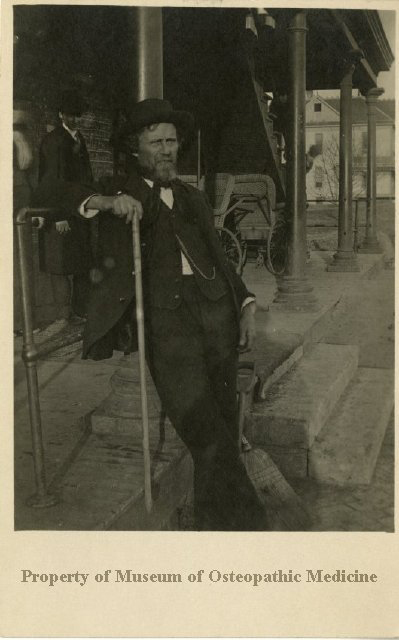 Postcard of Andrew Taylor Still on Steps of Infirmary with Cane, ca. 1917. Back of card is blank. 8.7 cm (w) x 13.6 cm (l). Good condition.